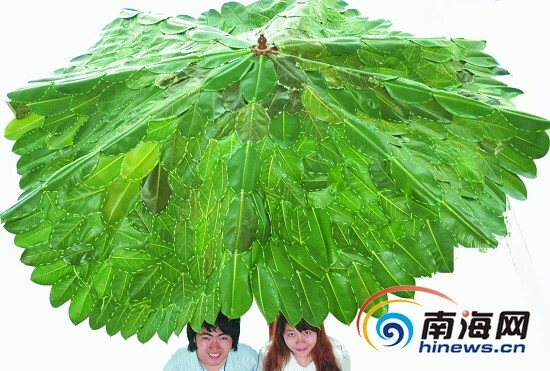 Two senior students at Hainan University have sewn a large umbrella using banyan leaves. The umbrella has a radius of 127.5 centimeters and an area of five square meters. The World Record Association awarded them the certificate for the "Largest Leaf Umbrella Cover" on Nov. 30. Zhao Xuanrong and Liang Chushi are senior students at the School of Economics and Management under Hainan University. Zhao is from Beijing and Liang from Guangzhou. As a couple, Zhao is handsome and chatty, while Liang is pretty and quiet. "As we will soon graduate, we wish to have a unique souvenir for this period of our youth," Zhao said. 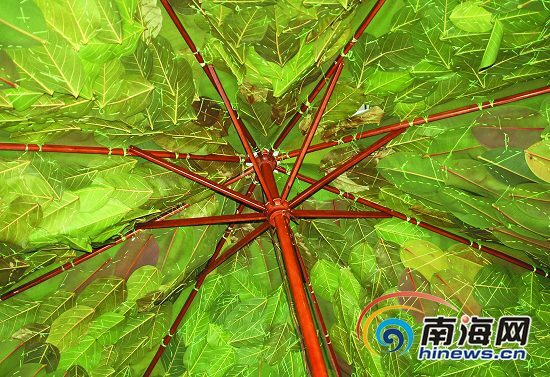 When they were in Baishamen Park near Hainan University in October 2010, they saw rounded and bright fallen banyan leaves on the ground and came up with the idea to make an umbrella using leaves. "Our idea is wonderful, but we met plenty of difficulties when making it. We had to first overlap the leaves and then weave them together with thick stitches. We had to use just the right amount of strength in this process in order not to break the leaves. It took us several minutes to weave a leaf onto the umbrella frame. Furthermore, we did not expect we would need so many leaves to make an umbrella. We had to collect leaves from nearby areas again and again and used more than 600 leaves and 10 reels of thread. It took us more than a week to make the umbrella," Zhao said. They also tried using other types of tree leaves to sew the umbrella cover, but failed. The umbrella is completely made of Indian banyan leaves because they are thick and tough.